Another dual core Cortex A9 RK3066 based Android Mini PC emerges from the chinese hardware churning factories. Quite similar to earlier reviewed RK3066 models, it reads as a solid performer. As we find out, the “brand” Jesurun comes with some tradition behind, as there have been -rather obscure- earlier models purposing Android 2.2 onwards OS over different hardware bases, over this last year. Their latest iteration on Android Mini PC solutions includes Android 4.1 preinstalled, the usual 3D and 2D graphics and video performance and expansion ports. Anyway, the guys responsible for the Jesurun line of Android on a Stick PCs did surely place their efforts on the right path by embracing a -by now- proved RK3066 based Android solution. 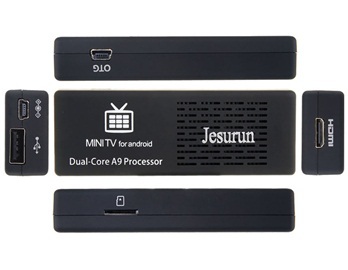 What’s inside the Jesurun Mini TV Android on PC ? At the risk of being repetitive, we can find the usual stuff inside this nice Android on PC stick. For a start, it includes a Mali quadcore GPU 400, which enables almost any game to run smoothly enough. It comes with 1 gb of DDR3 ram and 8gb of flash ram for storage purposes, accepting up to 32 Gb of extra flash ram through it’s microSD slot. On the network side, you will find a b/g/n WIFI adapter (capable of up to 150mbits /s on its N mode). You can plug an USB hub into the USB port included, and connect through it a standard USB mouse, keyboard, webcam, etc. In order to connect this small Android on a Stick PC to your TV, you will use the Mini HDMI female host port. As the chinese brochure infers, the Jesurun comes with Google Play Store access.